What would happen if you asked your class the same question? What answers might you get? Would they embody and embrace the same ideas that you do when thinking about a safe classroom? In order to have an effective learning environment, it must be a safe space. Students will be much more willing to explore new ideas, grapple with difficult concepts and engage in challenging histories if they feel that they have the intellectual and emotional safety to do so. Here is one strategy to be used at the beginning of the semester in order to create a safe space in your classroom. The idea behind this lesson is grounded in the theory of Inquiry Based Learning. This is essential as, “inquiry ... requires more than simply answering questions or getting a right answer. It espouses investigation, exploration, search, quest, research, pursuit, and study. It is enhanced by involvement with a community of learners, each learning from the other in social interaction.” By asking the class, “What does a safe classroom feel like?” Students will go on to have a conversation that will help them create the contract/guidelines to ensure their own safe space. This inquiry question will allow them to engage in the material, challenge ideas, create new understandings and embody the final product. The role of the teacher here is not to teach, but to facilitate discussion, probe, and challenge ideas, thereby allowing students to create their own collective definition of a safe classroom. 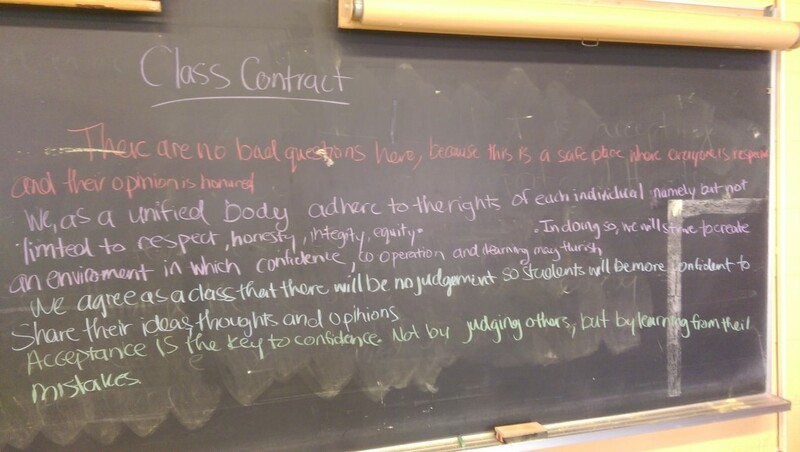 In the end, you will have constructed a classroom contract with your class - one that can be referred to when broken and when created properly will be a contract upheld and defended by students. On the board, write: What does a safe classroom feel like? Give students a minute or two to silently reflect on the question. Continue to direct their thinking by next asking them to choose four to five individual words that describe what a safe classroom feels like to them. If students are struggling, have them write down their ideas on a piece of paper. Give each student a piece of chalk and ask the class to go up to the board and write down one or two words about how a safe classroom feels to them. Encourage students to only use each word once. Make sure to prep students by telling them they will have to explain why they chose the word that they put on the board. 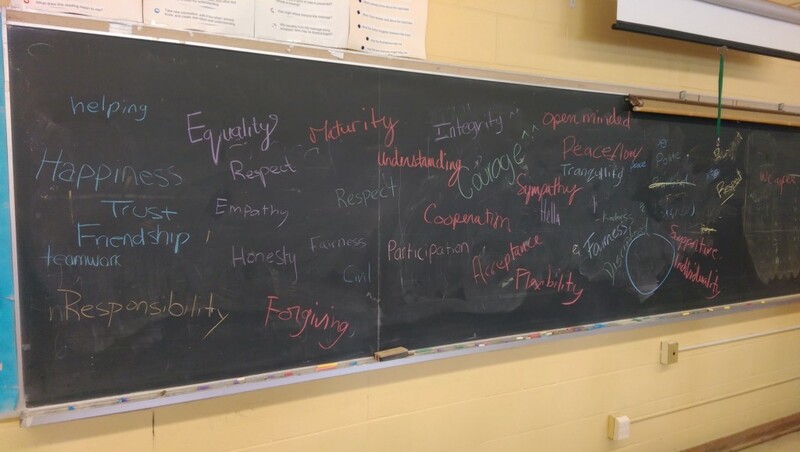 As the facilitator, explore each of the words on the board and why each is important in creating a safe classroom environment. It is important to give value to each word on the board and ask each student to participate by explaining the word they wrote. This needs to be inclusive of all parties. Ask each student to write on a piece of paper - or a journal for the course - two or three sentences using a minimum of three to four words from the board. Break students into elbow partners to share their writing with a partner. Allow them to share with a small group to explore their opinions before asking them to share with a larger group. This is an important step in creating a comfort level for students. Ask each group to pick two sentences that they feel best represents a safe classroom. As an alternative form of presenting, student groups could write sentences on chart paper to be posted at the front of the room. After each group has chosen their two sentences, have each group read the sentences aloud to the class. Ask the class to pay close attention as there will be a class vote to decide which sentences they will choose to represent their safe classroom. 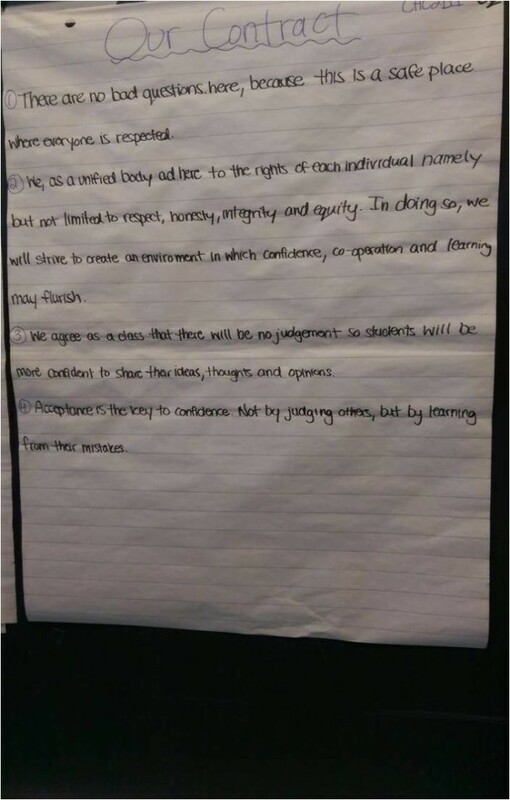 Vote on which sentences best represent a safe classroom. 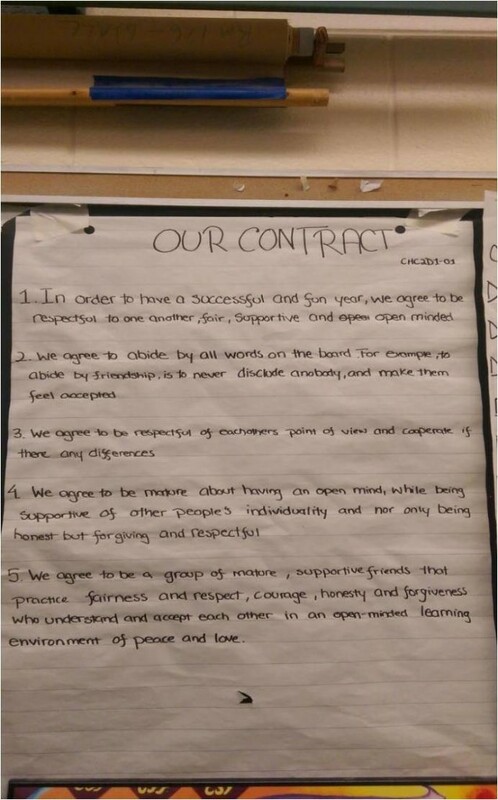 Once the contract is on the board, ask the class if there are any changes they would like to make to the contract. If not, ask if everyone agrees to the contact. Here we need everyone to agree. If they don’t, then you need to probe why that individual does not agree and find a meeting point where the whole class will agree. Post the contract on the side of the room and refer to it and amend it throughout the year as needed. I have now used this lesson in three different classrooms: one grade 11 Genocide and Crimes Against Humanity Contemporary Implications class and two grade 10 Academic Canadian history classes. Each time new ideas surfaced, but there was one constant: student ownership. When students take ownership, they are more likely to engage in their search for answers. They will begin to respectfully challenge information and ideas that are presented in class, making connections and learning about the importance of civic engagement. In facilitating students through the process of creating a safe space and a classroom contract, teachers give the students the tools necessary to explore difficult histories and challenge our present-day issues of racism, prejudice, and ignorance, helping shift “our” status quo. READ MORE: About the kinds of conversations Facing History teachers have in their classrooms here. GAIN TOOLS: For more Facing History classroom strategies on having difficult conversations, click here. Jason Monteith has taught history, geography and cooperative education in his 9 years with the Toronto District School Board. At his current school, he is the department head for the Canadian and World Studies Department. In this role he oversees the delivery of courses focusing on history, geography, politics, law and civics. Jason is currently teaching Genocide and Crimes Against Humanity as well as Canadian History. As an educator he is passionate about building capacity within his students, encouraging them to become fully engaged citizens who critically engage with the world around them, enabling them challenge the status quo. He writes in reflection of classroom successes in order to share best practices and to learn from others.